With a stay at Chateau Du Val De Ceze in Bagnols-sur-Ceze, you'll be within a 15-minute walk of Place Mallet and Albert-Andre Museum. Featured amenities include a computer station, complimentary newspapers in the lobby, and multilingual staff. Planning an event in Bagnols-sur-Ceze? This hotel has facilities measuring 3981 square feet (370 square meters), including conference space. Free self parking is available onsite. When you stay at Chateau De Meracq in Meracq, you'll be 14 minutes by car from Musee Gallo-Romain. Free self parking is available onsite. 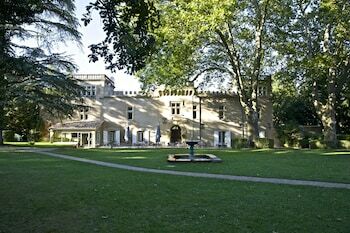 Located in Arles, Mas Petit Fourchon is within a 15-minute drive of Alyscamps and Theater-Antique. Free self parking is available onsite.